The center is a medically-supervised multidisciplinary unit with comprehensive programs to assist clients with weight- or nutrition-related concerns. It offers a variety of weight loss and maintenance programs for both children and adults based on the sound science and clinical expertise. The center helps individuals reach their proper weight and fitness goals. It also helps patients adopt healthier lifestyles to prevent complications of existing health problems such as diabetes, high blood pressure and abnormal cholesterol levels. How is the Weight Management Center unique? St. Luke's Medical Center set up the first hospital-based weight management center in the Philippines. Research has shown that a holistic weight management approach combining strategies that address a person's nutritional, exercise, behavioral, physical and psychological needs increases chances for long-term success. The center has a team of highly-skilled professionals including physicians from multiple specialties, dietitians, fitness trainers and behavior therapists. It is a one-stop shop with medical consultation rooms, nutrition counseling rooms, body composition analyzers and a fully-equipped gym. Who will help me through the program? A team of highly-qualified professionals that will guide you in your journey to a healthy weight. Licensed nutritionist-dietitians will help you monitor and plan your meals. Certified fitness trainers and/or physical therapists will ensure that each exercise program is individualized, safe and effective. Cognitive behavior coaches and psychologists can help you develop the mindset and skills to stick to the lifestyle changes needed to lose weight and maintain it. Furthermore, board-certified physicians direct your program and check your progress. During the screening process, our dietitian will measure anthropometrics such as height, weight and body fat. A weight management specialist will recommend further tests if necessary and help customize a program just for you. Once the test results are ready, enrollees will be scheduled for specific clearances as needed (e.g. from the endocrinologist, cardiologist, rehabilitation specialist, surgeon, nutrition support physician, pulmonologist, and/or psychiatrist). Just give a call or walk in so you can be screened and assessed for the program that best suits you. What are the programs of Weight Management Center? The patient will initially be seen by the Clinical Nutritionist and Dietitian. Body fat will be measured using the body fat analyzer. A complete history and physical examination will be done. The primary objective is to screen patients to determine eligibility for enrolment. Burn It Package: At this stage, patient is enrolled in the treatment program. As needed, a series of ancillary procedures and laboratory examinations shall be done to evaluate the presence of associated medical conditions aside from weight problem. This is a physician-supervised weight management program. Facilities of the Weight Management Center gym will be used for the exercises. Fit Factor Package: This phase ensures proper follow up after the Burn It Package. 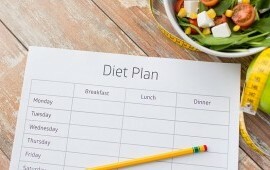 Healthy Bites: This is a guided nutrition program to aid in weight loss and weight management. Fat Burner: This is an exercise program medically guided to ensure increase in physical activities. Shape Up Package: A continuation of the Fat Burner program including the use of gym facilities for one month. Start Up Package: The patient will initially be seen by the Pediatric Specialist and Dietitian. Body fat will be measured using the body fat analyzer. A complete history and physical examination will be done. The primary objective is to screen patients to determine eligibility for enrollment. This phase, which lasts for 3 months, follows the screening. It includes various diagnostic procedures such as Chemistry12, CBC, Urinalysis, Electrocardiogram, Treadmill Exercise Testing, TSH, and Modified OGTT (2 hours). This phase follows the screening and serves as a clearance prior to surgery. Additional test includes the Pulmonary Function Test. This phase ensures proper follow-up after the Therapeutic Phase or the Peri-Bariatric Phase. This phase, which lasts for 3 months, follows the screening. It includes various diagnostic procedures such as Chemistry12, CBC, Urinalysis, Body Fat Analysis (2x), and other diagnostics as requested by Physicians. This phase discuss long term weight loss and maintenance goals, continued family counselling and nutritional program. "A woman with severe weight problems and a 62-year-old real estate businessman recovering from cancer are oddly the partners in an annual race meant only for the strong and physically fit."